I have had this plant for 8 years. In the past it has been short because of the deer eating it. This year we have had few deer and it has bloomed. I didn't know it would. Thank you for your help naming my plant. Hi Ann, this is one of my favorite Sedum, and I'm not surprised the deer like it. It's Sedum 'Purple Emperor', and along with attracting deer to your garden will almost certainly be a bee and butterfly magnet while blooming. The nectar is irresistible to them. If you can keep the deer at bay, it will reach up to 40cm (16") tall, and make a clump with several to many stems, each topped by one of the blooms - although this variety doesn't have the size of flower and the long lasting flower stalk, it is still a very attractive plant, mostly for the mahogany to purple stems and leaves. 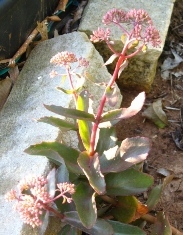 Great plants for xeric gardens, these types of Sedum grow best when planted in a well drained soil, on the lean side. Over fertilizing will lead to over soft growth which flops away from the center of the clump, requiring frequent pruning. See more on the Sedum and Sedum for Borders pages. Wow, that was speedy. Thank you for the ID and information about Purple Emperor.